Experience the highest degree of beauty, design, and craftsmanship by browsing the Extraordinary Collection of Roman Malakov. Showcases few of the many rare, and fine pieces handcrafted by Roman Malakov. Gorgeous and outstanding necklace featuring a heart shape diamond center stone accented by fancy cut and fancy color diamonds set in an intricate”Lion’s Mane” ; design. Finished with round brilliant diamonds in the outermost layer. Thank you! We will call or email you to confirm the appointment. An important necklace that took Roman Malakov more than a year to source the stones, and make. Showcases perfectly-matched pear shape emeralds, surrounded by a row of round brilliant diamonds. An absolutely stunning intricate and creative design. Thank you! We will call or email you to confirm your appointment. A unique and magnificent piece that showcases the two magnificent sides of diamonds. 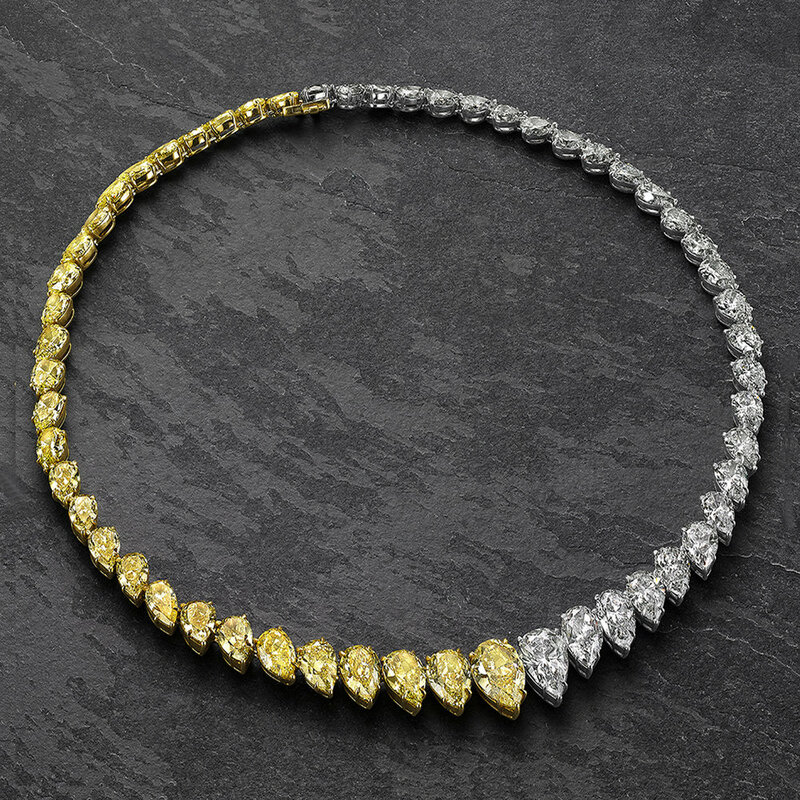 On one side, it features fancy intense and vivid yellow pear shape diamonds that graduates in size. 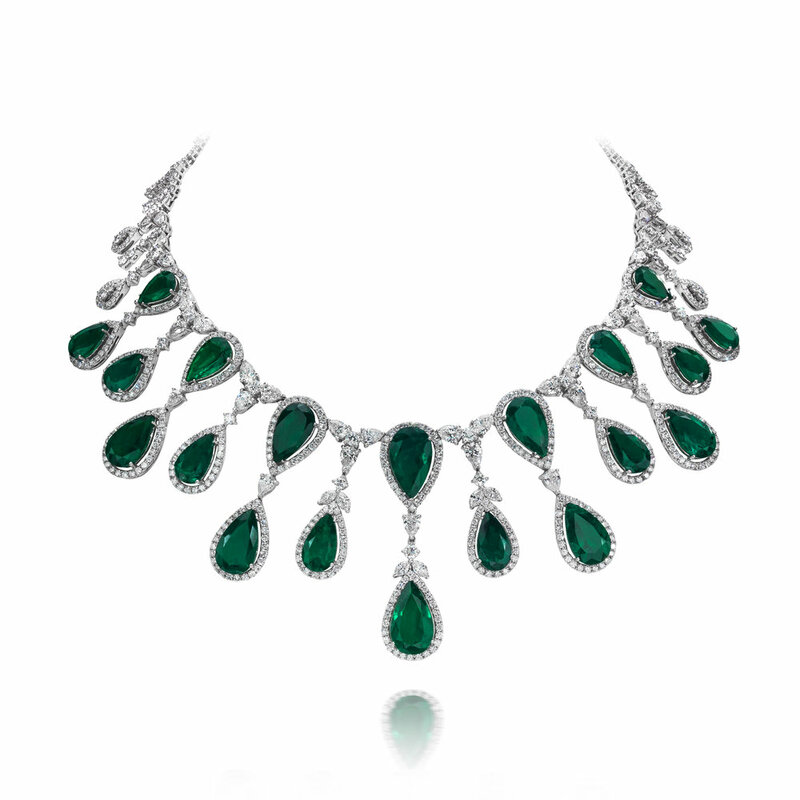 On the other, the necklace features sparkling white pear shape diamonds that also graduates in size. Handcrafted in 18k yellow gold and platinum, each diamond are carefully inspected and perfectly matched to produce this masterpiece. This beautiful necklace features 47 natural brown round brilliant diamonds weighing 68.57 carat total. Each brown diamond surrounded by the row of white round diamonds in a floral motif style and spaced by white marquise diamonds. Total weight of white diamonds 64.76 carat. The necklace made in 18K white gold. Intricately designed to be a luxurious piece. Showcases sparkling pear shape diamonds spaced by marquise diamonds elegantly arranged to look like leaves branching out from a delicate stem. Gently splits in two, midway and weaves at the center.